Hey, Everybody - The Latino Health Forum 2008 is coming up October 7! What? You didn't know about the Latino Health Forum? It's an annual event presented by Sea Mar Community Health Centers, Public Health Seattle-King County, and the Consulate of Mexico in Seattle to coincide with Binational Health Week. 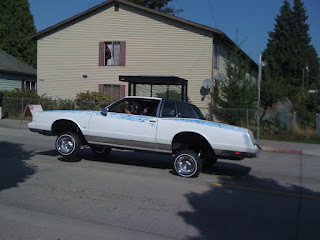 The event will take place at South Seattle Community College, all day Tuesday the 7th. For more details: http://groups.google.com/group/latino-health-forum-seattle?pli=1 or call Spence Comstock at 206-788-3200 or Irma Farsch at 206-764-4700. This is one of those significant events that would be terrific for the right sponsor...especially if you work in the healthcare industry, your organization may want to think about this kind of opportunity in your 2009 planning to reach local Latinos! Hey, reading the Tri-City Herald I just learned that my alma mater, Washington State University, is doing a terrific job recruiting Latino students *and* staff for its Tri-Cities campus! According to the article by Michelle Dupler, multicultural students enrolled in Fall 2008 represent 15% (versus 12.6% last fall). Multicultural students at the Pullman campus are at 15.1%, although a definitely different makeup than those at Tri-Cities, a more traditionally Latino market. Students at the Tri-Cities campus id'ing themselves as Hispanic nearly doubled from 2006 to 2008--from 75 to 141. My favorite part of the article was the quote from Chancellor Vicky Carwein, who said the campus is making an effort to recruit not only Hispanic students, but also Hispanic faculty and staff. She said, "Studies show you do a better job of recruiting and retaining Hispanic students if you have faculty and staff that are like them." Congrats to WSU Tri-Cities and to its new director of student affairs, Jaime Contreras, who has helped educate the educators on this significant issue. Just read about Sedano's grocery store chain in the Miami Herald at http://www.miamiherald.com/business_monday/story/704935.html. This is a Florida Latino grocery store chain that is shifting their new stores to better appeal to the second-generation Hispanic while attempting to retain the first-generation shopper. This includes changes in decor (high ceilings, new colors) as well as product line (more prepared Hispanic foods as well as general-market products). It really shows where the market's going (in some geographic areas, anyway) when a Latino chain shifts its focus like that. Here in the Northwest, for the most part we're still working on the first-generation customer with our local retail. I remember Cost Cutters up in Everett, which underwent a complete makeover about four years ago. It had been a mainstream grocery store with some Latino customers, until the store manager got the brilliant idea that he could better serve his Latino customers' needs with more Latin American products and a festive ambience. Of course, that also included hiring more bilingual checkers and other staff to serve the customers he was expecting to shop at the new Cost Cutters. Once he made the switch he was amazed, because not only did it appear that all area Hispanics were now shopping at his store, but that their shopping carts averaged 30% higher receipts! This was likely due to the generally larger households in the Latino community and the focus this group puts on food and home cooking. The manager mentioned that, while he did lose some of his regulars who were not Latino, he gained loyalty among the Latino community almost instantly, and word of mouth helped business boom in a way that surpassed prior sales. He was content with the shift. Hey - I read a neat article in yesterday's Seattle Times http://seattletimes.nwsource.com/html/localnews/2008210083_biracial280.html about Seattle's mixed-race population. Turns out, we have the highest density population of biracial or multiracial people in the country! Why is that? Because historically we had smaller populations of minorites, so more "mixing" was happening. This article was likely spurred by Obama's run for president and the subsequent new focus on race. They say he'll be "the first black U.S. president," which is interesting, because he's actually mixed race. Somehow the minority race trumps Caucasian, and not just with Obama. This is my opportunity to gently remind readers that "Hispanic" is not a race. Nor is "Latino." They are both terms describing culture. Hispanics/Latinos can be of any race, or mixed race. Oddly, in government forms "Hispanic/Latino" actually trumps race. "White, non-Hispanic," "Black, non-Hispanic," "Hispanic." Interesante, ¿verdad? Some call Hispanics/Latinos "brown." There are books dealing with the "brown" race. Reading this reminded me of something that happened not too long ago with a Latina friend. We were looking at her family photos, and I noticed that several members of her family were black. I said with surprise, "You're a black woman!" And she laughed at me, because she thought I realized that all along. But I hadn't. I always identified with this friend as a Latina--not white, nor black, nor anything else. Hispanic, Latina, Venezuelan. So even in my own mind, apparently, being Latina trumped her race, which is mixed. I welcome any similar stories or lessons you might have. And I wish you a fabulously productive week! 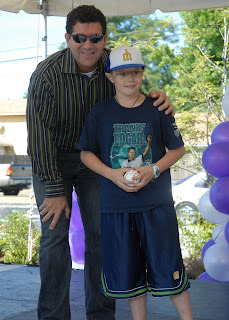 So...in case you didn't hear about the launch yesterday, famed former Mariner hitter Edgar Martinez and his wife Holli have set up a scholarship fund for Latino undergrad students and also for minorities pursuing teacher-training programs. He and his wife know how many students a teacher can affect, and how having teachers that look like us can really inspire us. But you know what? While Washington State schools had 24% minority students in the 2007-2008 school year, only 7% of the teachers were minorities. AND - in 2005-2006, only 16 percent of teaching certificates were issued to minorities. Now we know there's a problem with graduation levels in our nation and state--especially among minorities. And according to our own study of Puget Sound Latinos, we found that only 16% have attended or are graduating from college. Let's work on giving these students something to aspire to! Did you know that our own Pacific Science Center sets aside a special day for the local Latino community? They're working on their second annual Día de la Familia, to take place this coming Saturday. It's a really cool deal, where even the 3D movie, Wild Ocean, will be en español. Look for a laser show featuring música latina, live mariachis, and more! For times and other details, see their website: http://www.pacsci.org/diadelafamilia/. Discount coupons ($25 for a family of four) are available at the Plaza Bank Kent Station branch and were also inserted in the current La Raza del Noroeste newspapers. Could event be a fun event for young students of Spanish! If you go, please offer your comments on the event, attendance, etc + photos if you've got 'em right here on my blog! Local Hispanic Marketer makes good! OK, so one of my favorite publications that details the goings-on in national Hispanic marketing and media is...Marketing y Medios. And Mark Stockdale, director of Hispanic marketing for T-Mobile, has been featured in this month's edition! The reason? He's one of the Hispanic marketers who gets it, and his company is one of the companies that has been investing in end-to-end Hispanic marketing and support. So Spanish-speaking consumers are not only attracted to the carrier but become happy customers. Bravo, T-Mobile! Oh, and this is one of those lessons--lest you assume Mark Stockdale is a gringo, please note that he hails from D.F., aka Mexico City! Jaime Méndez moving to Bustos Media? More to come! Enjoy the weekend. OK so I just discovered a really cool program within the Seattle School District. Maybe you can help me spread the word? Guillermo Carvajal is launching the Latino Achievers Club, whose motto is Preparing Latino Boys for the Future. It's a school-based Latino project designed to give boys enhanced social and academic development, and will take place at three elementary schools in south seattle that show a high number of Latino students. Other creative (with a math and science base) ideas. If you or someone you know speaks Spanish and would like to lend your talents to this terrific cause, please contact Lead Coordinator Guillermo Carvajal at 206-252-0993 or gcarvajal@seattleschools.org. TODAY, SEPTEMBER 16 (not Cinco de Mayo) marks the anniversary of Mexico's independence from colonial rule. And fitting, I just received the latest Nordstrom catalog that features a full page dedicated to Hispanic Heritage Month and highlights regional winners of their art contest. Nordstrom actually does some neat things in multicultural marketing. In addition to an annual nationwide arts-related contest, the department store chain also holds a local Latina Empowerment Summit right here in their downtown Seattle store. This year's Summit takes place this coming Saturday, a half-day event en inglés that attracts 100 or more Latinas and Latina wannabes (although I won't be able to attend this year) for learning and mingling. An expert in the filed of crosscultural communication, Nanci Luna Jiménez, will be speaking, and there will be an education panel: Creating a Pipeline to Higher Education for Latinos in Seattle. Lunch will be served, and of course an opportunity to shop, shop, shop following this cool event. Attendance seems to grow each year, and we're thrilled Nordstrom has continued the tradition. Anybody interested in attending should call 206-628-1690 ¡ya! In case you didn't know, we just had a weekend jam-packed with Hispanic fiestas. Fiestas Patrias is that time of year when Latinos celebrate the independence their homeland gained, and most Latin American countries' independence were won in the late summer months. 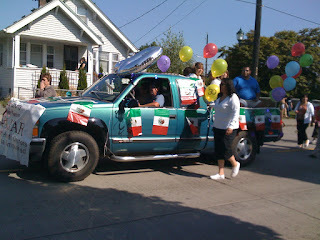 Mexico won theirs September 16, which launches Hispanic Heritage Month (clearly only celebrated here in the U.S. of A.) which isn't a month per se, but a month-long period from September 15 - October 15. 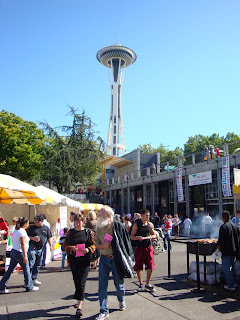 So right here in the Seattle area we're all over Fiestas Patrias, with celebrations all weekend long at the Seattle Center, a community parade in South Park, an entire day of Puyallup Fair dedicated to Latinos, and even a Bellevue celebration at Crossroads Mall. 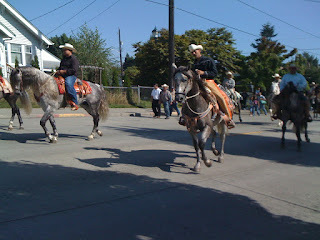 We watched the Saturday parade in South Park, and were amazed to see the turnout--especially among parade participants: The Latino Riders (a motorcyclin' group), Cascade Middle School Marching Band, some lowriders with the most unbelievable hydraulics, beautiful, dancing horses with their riders in traditional Mexican dress, lots and lots of participation from the various SeaMar groups in Washington state (SeaMar puts on the Fiestas Patrias parade), and even more cheap candy thrown to the bystanders that I kept picking up. See some of the photos I took to get the flavor. 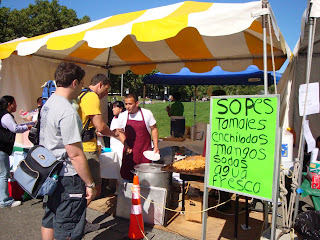 At the end of the parade, there was food and aguas frescas for sale, to benefit SeaMar. The horchata rocked! Jorge Madrazo of SeaMar took the stage and we also heard from Seattle Mayor Greg Nickels, Congressman Jim McDermott, Senator Margarita Prentice, Rep. Bob Hasegawa, and others. Then those beautiful horses showed off more of their fancy footwork! 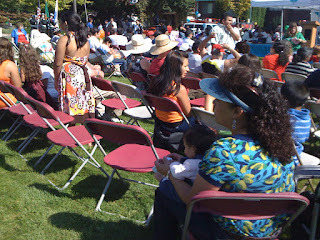 On Sunday, I stopped by the Fiestas Patrias celebration at the Seattle Center. There were several sponsor booths (including three banks vying for business from local Latinos!) and a good selection of south-of-the-border foods. The sun was out and people were enjoying some great live music in the Fisher Pavilion, everything from mariachi to bacchata. It was a decent turnout. The interesting thing about this celebration is that it served as an announcement to Seattle by the old Radio Sol--the new El Rey--of some changes made just a week or so ago. OK, so the name changed. The music's not supposed to. The DJs we knew and loved are off the air. A new live and local DJ just moved up from Bakersfield, CA to take the 10-3 weekday spot, and she's starting the week of 9/22. So this new DJ, Marimar Flores, was up on stage between sets, getting the crowd excited about stuff with interactive contests that got people out of their seats. She recognizes that she's not there to "replace" longtime DJ Jaime Mendez, but in any case people seemed to respond to her pretty well. We'll see how her show goes, and what happens to listenership at the station, which was finally on par with La GranD the last several months. If anyone attended the Puyallup Fair celebration on Sunday or the Bellevue Crossroads event, or other related events, feel free to add your feedback. Thanks for your participation! It was terrific being so disconnected and oddly there were only a few isolated incidents of wanting to dig up info I'd find on my iPhone (RIP at the bottom of Lake Washington, mi Blackberry), or a call I'd want to quickly make (versus figuring out the token or calling card systems in Europe). 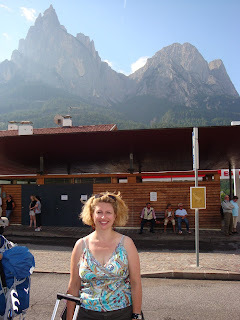 I'm including a picture here - at the train station in Seis, Italy. I was in Venice, Verona and throughout the Dolomites in between on a hike with a Seattle University class called Leading with Emotional Intelligence. Good stuff. One thing was made very clear during my trip: I am *not* an Italian speaker. Try as I might, I always ended up speaking Spanish whether or not the Italians spoke it. Just a habit, I guess, but in the end it saved my you-know-what to be able to speak a language other than English! For example when I lost my train ticket and asked about it at the nearby cashier in my broken Italian, the employee shrugged and clearly didn't get me. A customer, however, swung around and asked if I spoke Spanish, then led me to his wife's purse, where the ticket had found a new home after he'd discovered the ticket on the stairs! Not only did I make it on my train to Verona, but I enjoyed the ride with this lovely family. Another fantastic opportunity came when I enjoyed a plane ride with a couple who'd lived in Venice for 24 years--and was invited to have lunch with them at their home! It was the best part about that piece of the trip, because not only did I have their trust, but they showed me all kinds of great things about their life there, and the old part of Venice, that I could only get from a couple of awesome locals. Bravo, Mauro and Yolande! OK - stay tuned for a return to local stories - coming mañana!